Nov 26 - Auckland: Snake Pit, 10pm. The All Seeing Hand, made of Alphabethead (turntables), Ben Knight (drums) and Noel St Cosmos (vocals) celebrate the release of their debut album with a tour of the North Island of New Zealand. Final local support to be announced. Like The All Seeing Hand on Facebook. Listen to The All Seeing Hand on SoundCloud. 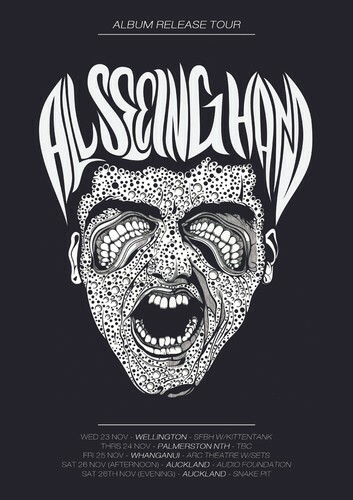 See The All Seeing Hand on tour!